The national president of MADD Canada, Patricia Hynes-Coates, is hoping to teach young students about the dangers of impaired driving, especially after using marijuana. 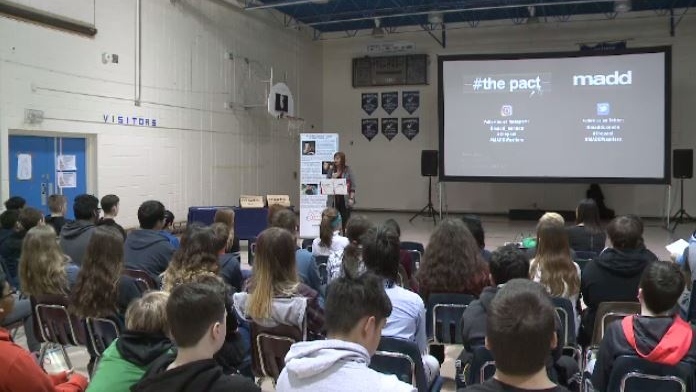 MADD Canada’s school assembly program visited Ethel Milliken School on Thursday, with a goal of educating elementary school students, who will soon apply for their driver’s licence, about the dangers of driving while impaired by marijuana. "We want to make sure that our students or our youth do realize that you are actually impaired, if you consume cannabis. Any substance you put in your body, you're impaired,” Hynes-Coates said. According to MADD, road crashes are the leading cause of death for 16- to 25-year-olds in the country. About half of the crashes involved alcohol or drugs. As well, between 2000 and 2010, 25.8 per cent of fatally-injured drivers aged 16 to 24 in Canada tested positive for cannabis. MADD Canada is hoping to reduce the amount of deaths by educating elementary school students about the dangers of impaired driving. "We don't want them having any substances in their system when they become of legal age to drive. And that we hope that they are able then to carry that message home to their siblings,” Hynes-Coates said. Students are also shown non-fictional stories from people affected by impaired driving. "These Grade 8’s, they're going to make the difference in the future. I mean they're the ones that are coming up and are next to get their driver’s license,” minister responsible for SGI Joe Hargrave said. For some of the students at the event, the message seemed to be getting through. "I didn't know that it can happen to anyone, and it's important to know these things,” Grade 7 student Lisa Navid said. "If you drink, or you smoke anything, you shouldn't be on the road, because you're putting other people’s lives in danger, and yours,” Grade 7 student Muiz Azeem said. SGI is sponsoring 20 presentations, while SLGA is supporting the other 40. Schools not included in the current presentation schedule can apply for a show by contacting MADD Canada. MADD Canada presenting to students in Regina.